Yesterday marked the first day of the letter writing campaign known as A Month of Letters, or more familiarly known as Lettermo. This year we woke up to snow and school cancellations so after a brisk walk to the postbox to mail my first letters of the month, I set up camp at the coffee table in front of the fire to write. So far I have sent out 4 letters and two thank you cards so I'm pleased with how things are going. Let's just hope my arthritis doesn't put a damper on things. I'm really enjoying getting back into daily letter writing. How are all of you who are participating in Lettermo getting on? Incowrimo has also commenced for the month of February so there are nice incentives to get out your stationery and keep those mailboxes full. January isn’t going quite the way I had planned. I thought after the holidays I would be able to ease back into my writing and still keep up with all the new changes in my household. It started out well enough, I had written a blog post about endings and beginnings for the new year, then the electricity went down and I lost it. I sighed, the electricity was reset and I was about to begin again when I had a nasty fall. I tripped and fell flat on my face bruising, well, just about everything. Then when I began to move a little easier, I had another little accident which made it difficult to sit at my desk and write. But, I am determined to get back to my writing so I am going to try to recreate the very appropriately titled “Endings and Beginnings” blog I wrote weeks ago for the new year. Fingers crossed I’ll get to post it this time! 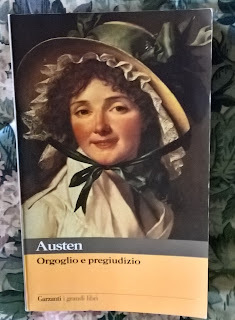 I’ve been reading books that feature letters from people in the 19th Century, most notably, Jane Austen. If you’ve read any letters from that era you will immediately notice they have a similar form to those we write today but are much more verbose in their opening greetings and closing words. Back in 5th grade, Mrs. Smith taught us that letters had an opening salutation, a body where we share our news and a closing where we take leave of our correspondent, not much has changed since then, just the style. I rather like the older style of starting and finishing letters, they sound so much more intimate and friendly. Today’s letters do have their own sort of familiarity but that antiquated mode of speaking and writing sounds very charming to me and I try to write in a similar way. I wonder at times what my pen pals make of my flowery greetings but to me they take my letters to a higher level. I am, after all, writing to a friend, not just a name at the end of a page. My business letters begin with Dear Sir or Madame, why shouldn’t my personal correspondence begin in a more sincere way? I strive to have a personal conversation with my letter friends, and I sometimes think the generic salutations and closings let me down. Of course, there is much to be said about letters that begin enthusiastically, i.e. “Patricia!” Or, “Merlin, you absolute sweetheart!,” when their letters delight you. Those sorts of beginnings show more familiarity than a simple “dear.” In the 18th Century these sorts of openings would have gotten raised eyebrows, but the pretty salutations of that era remain timeless. So, let us replace the overused “Dear” for something more amiable like “My Dearest” or “Sister of my heart” as they did centuries ago. Bring back that old-world charm and take your letters to a higher level. Don’t get stuck in the rut of “Your friend” or simply “Love” at the end of your letters, take leave properly by saying in a flourish: “I remain your most affectionate friend” or Your most sincere friend.” You will find that your letters take on a richness that your pen pals will savour and reciprocate, making your bonds of friendship stronger. Hello my lovelies. My pen has been silent for a while now and I thought I had better let you know why. My husband has been ill these past few months and has had two surgeries so life has slowed down in a way. As many of you know, we live in an old Georgian house which we are restoring and as we do not have central heating wood must be chopped. My husband is not able to wield the ax or chainsaw so my son and I have been doing the wood for the fire. It's an exhausting job, but must be done and while my son is in school, I do most of the sawing. But, muscles are toning and pounds are being shed so I'm not complaining. At the end of the day, however, my hands have a bit of a shake from the work; my arthritis causes other issues and so my writing suffers. I just wanted to let you all know why your letters to me are still unanswered. Once the holidays are over and my husband is back in the swing...by mid-January the doctors tell us...I will be able to get back to my letter writing and blogging. What could be better than receiving happy mail? You may be “surprised” at the answer. 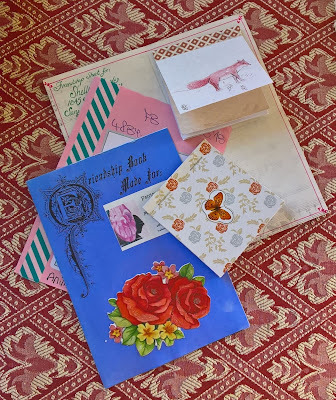 I didn't think there was anything better than a colourfully decorated letter or a small package of mail goodness until I found a little on-line group that send out random little parcels of happy mail. What is this fabulous group that sends surprise happy mail? The You've Got Mail Club, which began sending out swaps in 2015 allows you to create an account and opt to send a surprise to a fellow member. It operates much like Postcrossing in that once your surprise has been received and logged, your name goes on the list to receive a surprise based on your profile. This is relatively a new group, so membership is small and there are days when you opt to send a surprise and there are no available names to which admin cheerfully suggests, recruit more members! I've been a member for several months now and have had a very positive experience with the group. 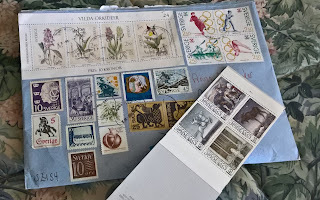 I've gotten some marvellous happy mail, several of which were truly surprises, like tea someone had handpicked and dried, an entire envelope of mint stamps from Germany and some beautiful craft papers. Those I've swapped with have been generous and as excited to send their swaps as they are to receive them. 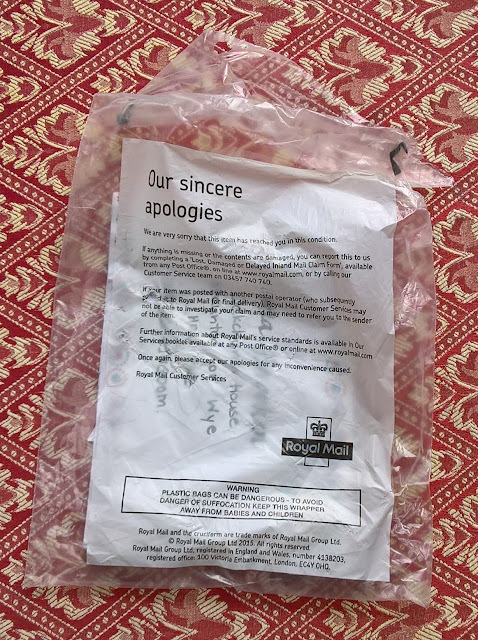 Surprises have travelled to me from as far as India, as well as Sweden, Italy, Germany and the Aland Islands and I have sent out envelopes of mail goodness to Russia, Philippines, Malaysia, Germany, Sweden and Italy so it is quite a diverse group. More importantly, I've made some nice friends, and even discovered a couple of Jane Austen fans to “Talk Jane” with. One of the fabulous envelopes I have received. If you want to join this happy little group of mail enthusiasts, go here to check out the You've Got Mail Club. I've enjoyed being a member and hope you will too. 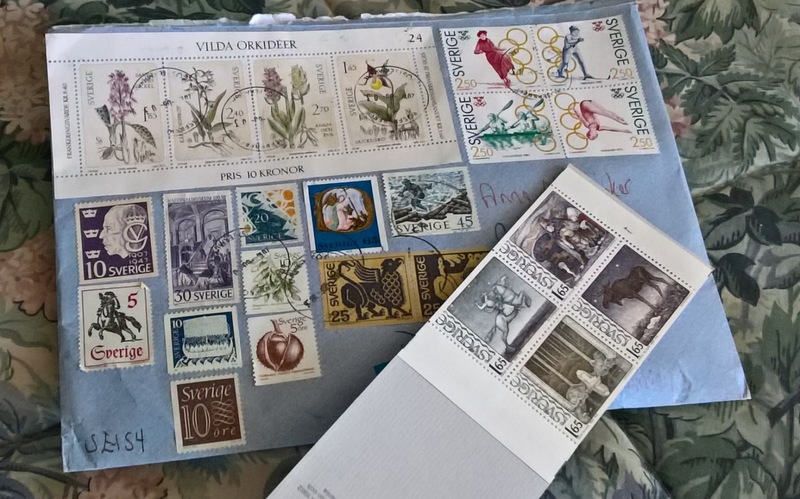 For those of you who are avid stamp or coin collectors, there are sister groups to this group such as The 100 Stamps club, Mint stamps club, Paper Money club and a few others, all listed at the bottom of the home page with respective links. 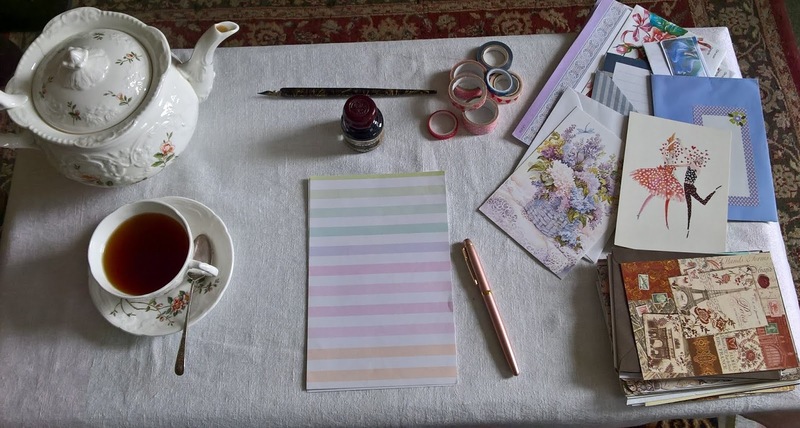 Today is World letter Writing Day. What are your plans? It's a gloriously sunny day here in Herefordshire so I am taking my little writing table out in the garden and intend to sit and compose my letters while I enjoy the light breeze blowing in the trees. There is a touch of autumn in the air now and soon my letter writing will be confined to the house which makes this even more of a day to savour. Since the Write On Challenge I have (amazingly) managed to keep on track with my letters and have only a few to write and what a nice day to have for the task. I hope you will take pen in hand and mark World Letter Writing Day with a missive or two...or five! Enjoy the day and perhaps you will be the recipient of a letter written on such an auspicious day.